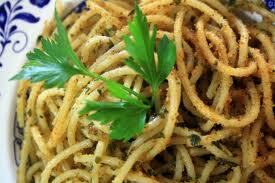 An easy, healthy, cheap (the approximate cost for each person is just £1.30) and quick to make spaghetti recipe. The secret to creating a great dish with such simple ingredients is to use only best quality, authentic Italian ones, such as extra virgin olive oil (even better if it’s organic), spaghetti from Gragnano and anchovy fillets from Cetara: the result won’t disappoint! In the meantime chop the anchovy fillets into small pieces and put them in a pan with the extra virgin olive oil, the crushed clove of garlic and the chopped walnuts. Cook on low heat for 3/4 minutes until the garlic starts to become slightly brown. Turn off the heat and add the breadcrumbs to the pan and stir well. Stir well on a high heat for 10/15 seconds. Serve adding some leaves of parsley to decorate each plate of spaghetti. If you would like to enjoy this dish with a glass of wine, it goes well with a fresh dry Italian white wine such as the organic Falanghina Rami DOC that you can buy from www.vorrei.co.uk for just £10.75 a bottle.